RANCHO SANTA FE — In an effort to raise awareness to the Rancho Santa Fe Association and its fellow members, Neighbors for San Dieguito River Valley Preservation, a group of residents opposed to a potential high-density housing development, offered a presentation at the May 7 Association board meeting. The group voiced concern over Rancho Librado, a potential high-density residential project that would see new housing built next to Chino Farms. 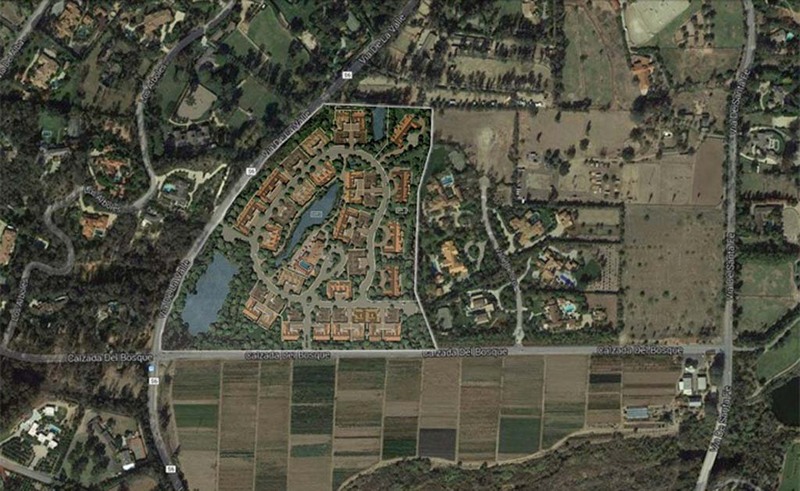 The four-parcel, 28-acre property located at the intersection of Via de la Valle and Calzada Del Bosque is currently zoned as semi-rural 2c, also referred to as SR-2. The San Diego County General Plan 2020 mandates one housing unit per 2, 4, or 8 acres. Saiid Zarrabian spoke on behalf of the Neighbors for San Dieguito River Valley Preservation. He told everyone that Rancho Librado has been worrisome to residents in San Dieguito River Valley. Currently, this area and its surrounding neighborhood have homes sitting on 3 to 20 acres. Zarrabian wanted members to know that the proposed applicant may want to try and amend this zoning in order to construct 54 homes and possible clubhouse. Current zoning, however, allows for a fraction of this. “It’s a high-density change that is out of character with the area and with the zoning. And it’s a zoning change that could set a dangerous precedence,” he said. Zarrabian’s speech with slide presentation triggered a unanimous vote among the directors of the Rancho Santa Fe Association. The directors voted 7-0 to uphold the General Plan zoning as well as the decision to craft a letter to the County of San Diego Planning Department, indicating their support in upholding the rural zoning for this area. Presented at the board meeting were 450 signatures, which were collected over the duration of a few days from those that opposed the high-density project. More than 350 were Covenant member signatures while the others were non-members. Rancho Librado, Zarrabian said, is an important issue for everybody because it’s not just a Covenant issue. Zarrabian also refreshed the minds of members about the history of this property and previous desires to develop it. Following the meeting, another member of the Neighbors for San Dieguito River Valley Preservation, David Allred, said one of their major concerns was that they did not want the Association to be blindsided by any developers. “It was important that the Association and board know and understand this, so they can take control of this discussion and our destiny,” said Allred. Allred went on to say that Lillian Rice’s vision of the Ranch was to have high-density in the heart of the Village. But as one traveled away from the center circle, lot sizes would expand. “That was the vision that Lillian Rice had and it’s that vision which has made the Rancho Santa Fe Community known worldwide as one of the best places,” he said. As for the Neighbors for San Dieguito River Valley Preservation, the potential of a high-density residential development in this area goes against these core beliefs and long-term vision. The group’s petition is available online at neighborsforsandieguitorivervalley.org.